This section covers specialist items from 1913 to date (want straightforwardstamps?). 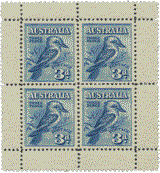 This includes Australian stamp varieties and flaws, imprint blocks, plate blocks, missing colours, coil joins etc. The stamps illustrated are the actual items you will receive. A beautiful selection of Penny Red shades many with Certificates includes Orange-Brown (OS) on rough paper, Salmon Eosin and Pink Salmon Eosin - you won't see many finer!